Lutz sheds his marketing duties, retains the title of vice chairman and will act as adviser on design and global product development. Editor's note: Some earlier versions of this story listed the wrong age for Susan Docherty, who turned 47 on Sept. 12. DETROIT -- General Motors Co. named engineering boss Mark Reuss president of GM North America while new sales chief Susan Docherty adds service and marketing roles in the automaker's latest management shake-up. Docherty, 47, tapped as vice president of sales in October, has been put in charge of marketing GM's four remaining U.S. brands and will lead the service and parts organization as well, Chairman and interim CEO Ed Whitacre announced today. She reports to Reuss, 46, who two months ago became vice president of engineering. 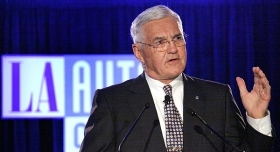 In addition, Vice Chairman Bob Lutz, 77, keeps his vice chairman title and cedes his marketing duties in once again becoming an adviser on product development and design. Whitacre's announcement unravels many of the structural changes GM underwent in July after it emerged from Chapter 11 bankruptcy. The moves also heap accountability on Docherty and Reuss, who both advance again after October promotions. “I want to give people more responsibility and authority deeper in the organization and then hold them accountable,” Whitacre said in a statement. That makes Docherty the point person for reversing GM's decades-long slide in U.S. market share and restoring luster to the surviving brands -- Buick, GMC, Cadillac and Chevrolet -- tarnished by congressional bailout hearings last year and this year's bankruptcy. GM now commands less than 20 percent of its home market, down from 51 percent a half century ago. Reuss, 46, returned to North America this fall in the engineering post. He had led GM's Australian unit, Holden, since early 2008. He is the son of former GM President Lloyd Reuss. 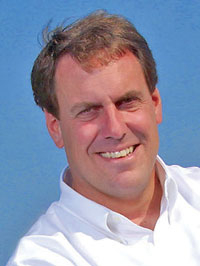 Mark Reuss: President of GM North America. The changes create a “new North American group,” GM said. The company had eliminated its North American strategy board after its bankruptcy. CEO Fritz Henderson had led North American operations himself until he was ousted three days ago. In addition to Reuss and Docherty, the North American management team includes Diana Tremblay, who becomes vice president of manufacturing. Her labor relations title is assumed by Denise Johnson, who had been vehicle line director and chief engineer for global small cars. •GM named Nick Reilly president of GM Europe. He became interim head of Opel after last month's departure of CEO Carl-Peter Forster. Reilly was appointed head of GM's international operations after the bankruptcy and had led GM's Asia-Pacific division before that. •Tim Lee, recently group vice president of manufacturing and labor relations, assumes Reilly's job as head of international operations. 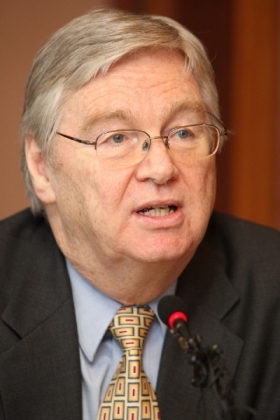 He will oversee GM's Asia-Pacific, Latin America, Africa and Middle East regions. •Tom Stephens continues in his role as vice chairman of global product operations, but will also supervise global purchasing. Robert Socia will continue to be vice president of global purchasing and supply chain. •Karl-Friedrich Stracke, who had been executive director of engineering, replaces Reuss as vice president of engineering and reports to Stephens. • Chris Preuss, vice president of communications, now reports to Whitacre. He had reported to Lutz. Nick Reilly: President of GM Europe. “We've realigned our leadership duties and responsibilities to help us meet our mission to design, build and sell the world's best vehicles,” Whitacre said. CFO Ray Young continues in his position. GM is widely rumored to be looking for Young's replacement, although cash salary limits imposed by the government because of GM's bailout have reportedly complicated the search. Whitacre, 68, a longtime telecommunications industry executive, became interim CEO following Henderson's departure. Bloomberg News said director Stephen Girsky would become an adviser, but Girsky was not mentioned in the GM press release. Analysts said the decision to make wide-ranging changes at the executive level suggest Whitacre expects to remain CEO for some time, possibly a year or longer. "You wouldn't shake up the management if you expect a new person to build his own team," said Logan Robinson, a long-time auto industry executive and professor at the University of Detroit Mercy School of Law. "If you're going to stay long-term, you're going to choose the team you want," Robinson said. "It's what we see in the latest round of changes." IHS Global Insight analyst John Wolkonowicz said he expected Whitacre to remain CEO until after an initial public stock offering, in part, to prevent U.S. government pay restrictions from hampering the search. Said Wolkonowicz: "What's he trying to say is we've got to move fast and we've got to move efficiently and we have to forget the way GM used to do it."